Retrieve the Boots of the Crusader from the Shrine of Kynareth. Find the Shrine of Kynareth and speak with Avita Vesnia. Survive the Grove of Trials. Retrieve the Boots of the Crusader. At the Priory of the Nine, Sir Juncan told you that Kynareth and her priestesses guard the Boots of the Crusader west of the Imperial City on the edge of The Great Forest, and that you must prove yourself worthy to receive it. If you make the "Nature's Fury" quest active, you will get a map marker for the Shrine of Kynareth, west of the Imperial City, just on the other side of the Red Ring Road. Go to the Shrine of Kynareth and speak with Avita Vesnia about "Boots of the Crusader", and she will tell you that to be granted the boots, you must pass Kynareth's test of worthiness in the Grove of Trials. She will only give you this information if you are not in the middle of a fight (i.e., there is no combat music playing). Otherwise, she will tell you: "Kynareth will show you no favor until your current conflicts are resolved. Finish your fights, then return here." Note: You will not get the choice to talk to Avita about the boots if the Knights of the Nine plug-in isn't the last to load (see Bugs). Your map marker will be moved to the Grove of Trials. 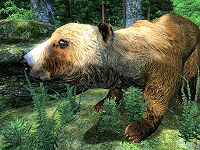 Proceed to the grove and after a couple minutes an oversized bear named Forest Guardian will approach and attack you. Do not fight back. The Guardian will stop attacking after several seconds as long as you do not attack back. After this, the bear will stop and a stone will move to reveal the door to Kynareth's Grotto. Alternately, you do not have to withstand the Guardian's blows. If you can prevent it from attacking, either through Calm, Invisibility, etc., the door will open. One method is to wear the Helm of the Crusader and use the lesser power "Serene Beauty" as soon as the Forest Guardian emerges. The calming effect will make it turn around and walk away, also allowing the door to Kynareth's Grotto to open. If you are riding a horse, there is a chance that the guardian will attack it. Approaching the grotto on foot is therefore advisable. Enter Kynareth's Grotto to find an altar holding the boots, with a Spriggan standing to each side. Ignore them (they do nothing) and take the Boots of the Crusader. If you choose to kill either of the Spriggans, you will acquire one point of Infamy. Completing this quest triggers an attack by the Aurorans on the Great Chapel of Mara in Bravil. Just like the attack on Anvil's chapel, you have no chance of preventing this event from occurring. If you visit Bravil you will find that the chapel has been desecrated and at least two of the chapel personnel (Marz and Uravasa Othrelas) have been murdered. After the entire Knights of the Nine questline is completed, the chapel in Bravil is restored and replacements for Marz and Uravasa (Beem-Kiurz and Eris Senim) become available who provide the same services, but Beem-Kiurz will not refer you to Oleta for Restoration Master Training, unlike Marz. Do not immediately put the Boots of the Crusader on the armor stand at the Priory of the Nine; you will need them to retrieve the Mace of the Crusader in The Path of the Righteous. You should not wear any clothing or armor with a powerful Reflect Damage enchantment. If the Forest Guardian dies because of your enchantments, you still fail the quest. The Forest Guardian occasionally gets stuck in the rock where it spawns, although this doesn't prevent you from killing it. 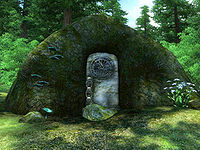 10 I have been instructed to find the Shrine to Kynareth in Cyrodiil's Great Forest, and speak with the Priests there about the Boots of the Crusader. 20 In order to be granted the Boots of the Crusader, I must travel to a sacred grove in the Great Forest and be tested by Kynareth. 21 I've reached the Grove of Trials. I shall have to wait and see what Kynareth has in store for me. 30 I have failed Kynareth's test. I shall have to try again. 31 I have failed to follow Avita Vesnia's instructions. I shall have to try the test of Kynareth some other time. 50 A bear attacked me in the sacred grove, but I made no attempts to fight back. A cave has been revealed, and it would seem the Boots of the Crusader are waiting inside. 100 Finishes quest I have acquired the Boots of the Crusader. It is possible to use the console to advance through the quest by entering setstage ND03 stage, where stage is the number of the stage you wish to complete. It is not possible to un-complete (i.e. go back) quest stages. See SetStage for more information. Esta página foi modificada pela última vez à(s) 17h45min de 12 de maio de 2014.